There's another new Android phone on the block. 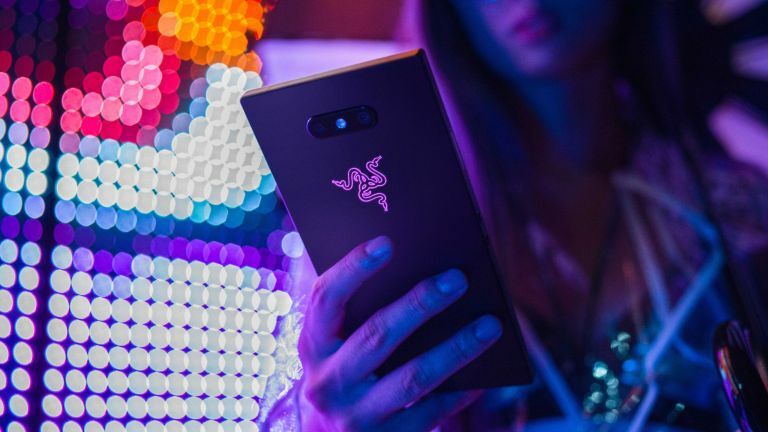 Hours after Samsung unveiled its quadruple camera-toting Galaxy A9, Razer announced the second-generation of its gaming-focused smartphone, the unimaginatively branded, Razer Phone 2. The Razer Phone 2 packs a truckload of upgrades over its predecessor, including Dolby Atmos dual front-firing speakers, IP67 water resistance, and a redesigned dual-camera set-up with Sony IMX sensors. If you're looking for a device designed to handle hours of shoot-outs in Fortnite, or adrenaline-fuelled chases through the streets of Vice City in Grand Theft Auto – this looks like the phone to beat. First thing you'll notice about the Razer Phone 2 is the lack of notch in the display. The Singapore-based gaming firm is vehemently opposed to the current trend in smartphone design, seen on the likes of the iPhone XS, Pixel 3 XL, and Nokia 7.1. Instead, Razer has used the sizeable bezels around the display to house dual front-firing stereo speakers, which are capable of supporting both HDR and 5.1 surround sound content with extra bass response. The chunky bezels serve another important function, too. When the phone is held in landscape mode, they become grips for players during intensive bouts of gaming. On the front of the Razer Phone 2, you'll find a generous 5.72-inch IGZO LCD display with 2560 x 1440 resolution, 120Hz refresh rate and wide colour gamut. Razer has also increased the brightness of the display by 50% compared to its predecessor. The improved display is shielded with Corning Gorilla Glass 5, which should keep the pixel-packed screen free from scratches – no matter how aggressive the gaming. Powering the Razer Phone 2 is the Snapdragon 845, coupled with 8GB of RAM. That should be more than enough grunt to keep even the most graphic-intensive titles moving at a clip. Razer has also built-in a Vapor Chamber cooling system, which it claims will efficiently sustain higher average frame rates during extended gaming sessions while keeping the handset from heating up. In a classic Razer flourish, the logo on the back of the new smartphone now lights-up and can be customised to change colors for different types of notifications – flashing blue when you get a Facebook notification, and green for a WhatsApp message, for example. In total, Razer says there are 16.8 million colour options available to pick from. On the back of the phone, Razer has completely redesigned the dual-camera system, which now uses Sony camera sensors with optical image stabilisation. Both cameras are 12 megapixels, including one wide-angle lens to squeeze more into the frame. Razer says it has increased shutter speeds and added optical image stabilisation to the secondary lens in a bid to improve low-light performance. Both the front and rear cameras now support smoother 60-fps video, too. Razer Phone 2 comes with 64GB of in-built storage, but this can be increased via microSD. There's also a massive 4,000mAh battery under the bonnet. Out of the box, Razer Phone 2 runs Android 8.1 with Nova Launcher. However, the company says an update to Android 9.0 Pie is already in testing and will be rolled-out as an over-the-air upgrade very soon. Razer Phone 2 is available in two finishes – Mirror Black and Satin Black. The new handset is available to buy today for £779.99, with the first units set to ship on November 9, 2018.